Amtech is a leading manufacturer of AC Drive. Amtech supplies medium voltage variable speed drives for a wide range of applications in the cement, mining and minerals; power; water; metals; marine and chemical, oil and gas industries. They are used to regulate / adjust the motor speed to the actual need, optimizing energy consumption and helps reducing CO2 emissions. With global Vision and Fast Changing needs Amtech has established a far Sighted Corporate identity. Amtech aims to meet customer’s expectation in the field of Motion Control, Automation, Power Quality and Industrial Electronics offering leading technologies on Global platform. Amtech has mission of developing technology to give total automation solution to our customers in the field of MOTION CONTROL. We are committed to comply with the requirements of the quality system, that we have created to make our products and services to satisfy our customer. To improve the effectiveness of the quality management system we identify our QUALITY OBJECTIVES to guide us in up-gradation of our product technology, have our ever-increasing market share in global market and improve customer satisfaction with passage of time. The quality objectives shall be periodically reviewed for their suitability. Technological innovations in motion control. TQM with effective quality system. 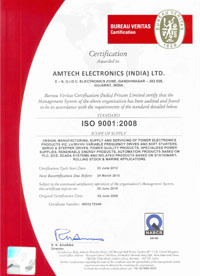 Quality System certified as per ISO 9001:2008 standard.